There are all sorts of classic maternal images. Tons actually. 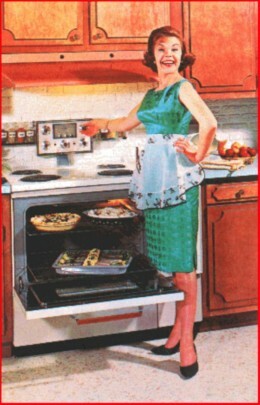 Some of the more iconic ones are those that show a fifties type house wife happily cooking for her children and husband while wearing a frilly, lace trimmed (and inexplicably spotless) apron. One of the traditional treats that are made for children are Rice Krispie squares. Everyone seems to love them. I do too, but I haven't made them in a really long time. Every Bomber game we tailgate and take turns bringing the main meal, snacks, drinks or appetizers. This past Saturday I was in charge of dessert and logan requested Rice Krispie Squares. I have come to realize that you either enjoy this activity or you don't. I fall into the latter category, 100%. During my Friday lunch hour, I had swung by the store and picked up Rice Krispies. Brad and Zach were going to the cabin, which means I wouldn't have access to a car. I was quite pleased with myself for being so forward thinking. We don't keep Rice Krispies in the house because while they make for great treats, as a cereal they are not the best. They do make a pleasing snap crackle pop noise when you add milk, but then you better get a move on because after the auditory fireworks they undergo a radioactive decay into beige mush in about five seconds flat. It was early Saturday morning and I had treated myself to a divine sleep in. I really needed one. I knew that Erin would be picking me up at 1pm, so I had to get on it. Anyways, I was all set to make the squares when I realised I didn't have any marshmallows. Welp. My only choice was to hop on my bike and head to the store, but I had some work to do before then, plus have a shower... nuts. Then Logan walked into the kitchen, my knight in shining track pants. Logan volunteered to cycle to Sobey's and pick up some marshmallows. Hallelujah. While he did that, I got some work done. He came home in a triumphant blaze of glory because he knew how much I appreciated it. With marshmallows in hand, I was ready to roll. The recipe is simple enough, melt butter and marshmallows, add cereal, put in pan. But melted marshmallow is like a white molten plastic, sticky and leaving web like strings of sugar every time it touches something. Once the marshmallow reaches this molten state, you add the cereal. I am convinced that no person who has ever made these things ever added the cereal and said, "I have added the exact right amount of marshmallow". It always seems as though you never have enough and there is no way it will coat everything. Somehow it does though. It gets really hard to stir it up because the cereal clumps together and sticks to EVERYTHING. Your spoon, hands, pot, counter... nothing is safe. Transferring the concoction to a pan was like an I love Lucy episode, I had krispies stuck to the stove, the counter and in my hair as I had tried to brush the hair out of my face while holding a krispie encrusted spoon. You have to move fast with this stuff because it starts to harden quickly. I finally managed to finagle it into two tins pans. It went a little easier once I realised that if you coat your hands in butter or water, the kripies won't stick to them. Where was that information 15 minutes earlier? Looking down at the pans however, I realized that my krispies were about 2 cm thick. Which of course is ridiculous. My only choice to remedy the situation was to flip one tray of krispies on top of other. It worked well enough. I added some blue and gold colored sugar on the top and walked away before I made things worse. I quickly ran upstairs to have a shower. Had a mild panic attack when washing my hair because I felt something foreign, it was the aforementioned krispie that I had got in my hair earlier. But thanks to the half life of the cereal, it degraded into mush in no time. Now there are only two things that a Preston woman (after all I am only a Hargreaves by marriage) is on time for; Work and Football games. Everything else has a fluid start time. So when Erin's husband Sean was standing at my door ready to go at precisely 12:59, I was shocked. . I am not of fan of keeping people waiting, so I was running around like a mad woman trying to gather everything up; jerseys, drinks, jackets..and of course... the Rice Krispie squares. It was a good thing Sean asked if I had the tickets and parking pass or we wouldn't have gotten very far. The kids gobbled up Erin's chili, which was so amazing I was reluctant to serve my ghetto krispies, but the kids ate those as well, providing another example of children's undiscerning palates. In many ways I am not exceedingly maternal in the classic sense; I work too much, swear like a sailor on leave and an incapable of making a simple Rice Krispie treat without getting 3rd degree marshmallow burns. But the spectrum of what maternal means has grown since the fifties. In my mind it's connecting with those that you love and looking after them. That can mean children, your family or your friends.. and by that definition, I'm doing just fine.